I really really really love birding. I enjoy birding on many different levels, from chasing regional rarities to bird photography; from meeting other birders at bird festivals to coordinating the ABA Bird of the Year program. When I ponder which aspect of birding I find most enjoyable it has to be... birding my local patch. Seeing a new bird at my patch is an equivalent thrill to seeing a life bird. And double the fun when I see a life bird on my patch! Becoming an expert on the birds in my neck of the woods is soul satisfying and personally fulfilling. Why is that? I wonder. My favorite personal patch is the Avimor community in the foothills north of Eagle and Boise, Idaho where I work and have lived. Avimor was a private ranch for over 100 years and so birders never birded here before 2007. 20,000 acres of undiscovered country as far as birding was concerned. 140 species have now been documented over the last seven years at my patch. I've seen all but a couple of these species myself. A handful of other birders have been contributing to the growing list of species and hotspots within the patch. Nobody even realized what a birding gem that this area could be. That little wanna-be National Geographic explorer in me finds immense satisfaction in being a birding pioneer in this corner of the world. eBird has been my tool for recording bird sightings at my patch. In 2010, I finally succeeded in submitting at least one checklist for every week of the year. With each new year and each new season, the accumulating data makes the eBird barchart for Avimor more complete, more accurate, and more robust. 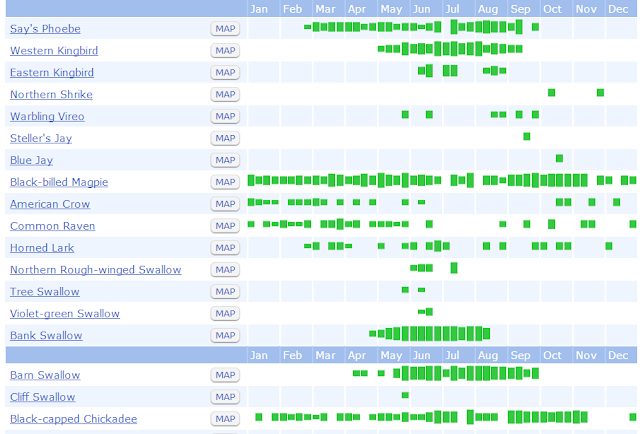 These barcharts become a tool themselves for me in understanding the arrival and departure dates of migrating species. I can look at other graphs in eBird to better understand frequency and high/low counts. I can unapologetically and proudly say that nobody knows Avimor birding better than me. It is my patch and they have become my birds. While I have this deep sense of ownership of birding my patch, I delight in sharing it with dozens of others. I regularly host bird walks there and individual birders will sometimes join me for my lunch hour birding. A new Avimor resident is a transplanted Missouri birder. He may soon become more expert than me on Avimor birds. I get very excited when he sees a bird at Avimor that I have never seen there before. I'm thrilled for him and for the growth of the Avimor Life List. I confess that I get a tiny pang of covetousness wishing I had been the first to see it though. In just a few years of regularly birding the place, I've come to recognize some of the individual birds. I know the best places to see certain species during the various seasons. I've learned where most species prefer to nest, roost, and feed. I'm creating memories and associations with the birds and the landscape. "Here's the grove of trees where the Lewis's Woodpeckers will show up for two weeks in May. There is the rock where a Canyon Wren came and hung out at eye level to the delight of my group of beginning birders. In that little depression is the nursery for young Lazuli Buntings in late summer. Here's where I saw my life Gray Catbird and over there a Pacific Wren. That rock pinnacle is where a Ferruginous Hawk nested a couple years ago. In those Hackberry trees up that draw you can kind find Great Horned Owls or Long-eared Owls nesting on old Black-billed Magpie nests." Avimor still has more acreage to explore, canyons to hike and hills to climb. I estimate that I've only familiarized myself with a quarter to a third of the entire area. Oh, and there are certainly still more birds to discover. I have a list of nearly one hundred additional species that have been seen in the surrounding counties which may show up any day at my patch. So, a deep and intimate knowledge of my patch and its birds combined with the adventure of discovery makes patch birding an incomparable thrill. Tell me about your patch and what makes it great. Or what aspect of birding do you find most soul-satisfying and fulfilling? I think I agree with all your points. I don't quite have a patch yet. The closest I have is the pond and feeder at my parents' house which I see a few times a week and the pier, which is a green walkway extending about a mile into the Hudson River. But not living here, I don't get to fully know the pier (it has more exciting birds than my yard) - but I can tell through ebird who truly knows it the way you know your patch. And hopefully, one of these days I can meet him and begin to see the pier with all his through the eyes of the knowing. As I was reading your post, it struck me how similar your sentiments were the the naturalists of times gone by: Thoreau, Leopald, Muir, etc. They had such intimate knowledge of the land and its residents. It's a vital type of knowledge - and one that I fear we lose more every year and every generation. I think I am a member of the last generation who was about to play outside in woods before the forests were feared and play became synonymous organized sports or indoor video games. As someone striving to become a professional in the field of ecology and conservation (particularly avian), not having innate knowledge of the land is like moving throughout the world with only some of my senses. I recognize that such knowledge comes with dedication and there is no miracle alternative. I look forward to seeing it grow year by year, but recognize as it slowly develops, my sense of pristine and what used to be will be a far cry from the glory of what once was. Robert, you already know that I am like you. I like to fill in the data on my local patch. I get so excited when I see a new species there. Last week I added dusky flycatcher to my Michael Perry Park patch , but it wasn't until I got home and checked my ebird stats that I realized it was a Life Bird as well! I have other birding buddies who are chasers and that is fun at times, but my best fun comes from keeping consistent records of a patch, or birding in places where no one else does or has! I am so glad that yo have contributed so much to the eBird Data for your location and for Idaho over all, which I know is tremendously under-birded! I can only hope that one day you and I will be able to go out birding together! I want to see your Patch! The aspect of birding that I find most satisfying is the fact that it is being in a state of constant discovery. Having a hightened sense of attention to your surroundings and being atune to the details and sight and sound of things that up until recently I had never stopped to recognize or appreciate. The fact that I have to force myself to pause, be patient, and wait for the pleasure of recognizing something new or unique. When I am out birding I feel like I am the only one out there with the real story of what is hapening. The joy of a new bird is unlike anything else. And the joy of a reward for my patience and attention is worth all the waiting, walking and listening.